The purpose of stability testing is to provide evidence on how the quality of a drug substance or drug product varies with time under the influence of a variety of environmental factors such as temperature, humidity, and light, and to establish a re-test period for the drug substance or a shelf life for the drug product and the recommended storage conditions. As different countries have different climatic conditions, each health authority requires stability studies to be conducted in the conditions corresponding to their ‘climatic zone’. There are also ICH guidelines for stability testing, that are to be followed in order to ensure broad acceptance of the studies. You can have a look at them here. 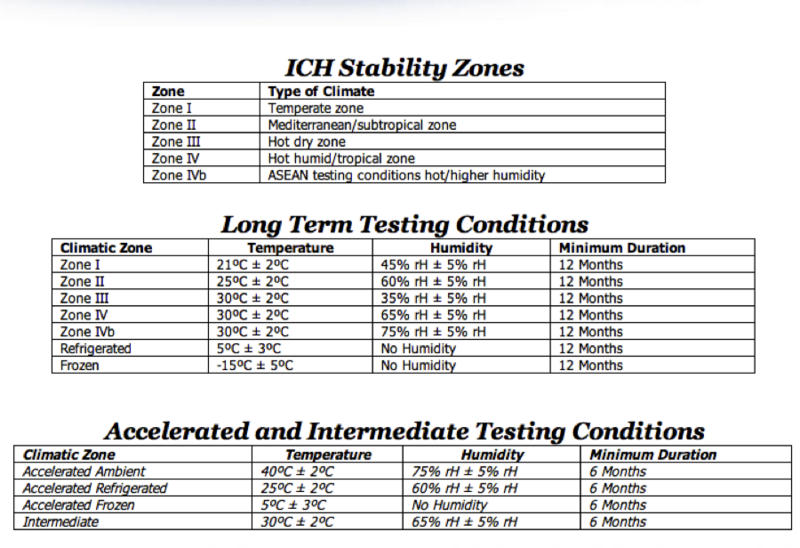 Below, a summary of the stability conditions per zone, and here a list of countries with their respective climatic zones. As stability testing is a long process, (you need to produce real time-scale data for as long as the intended shelf life of the product you intend to register) it is recommended to run tests for all the climatic zones in paralel as early as possible after definition of the final formulation.